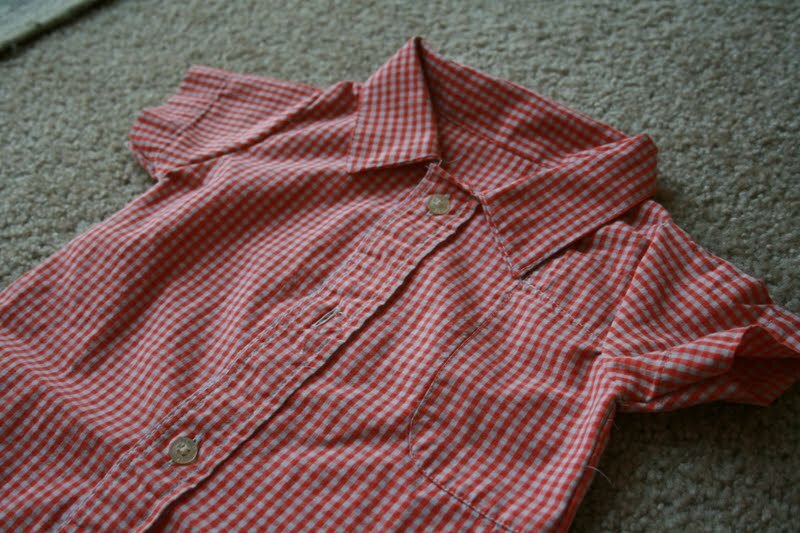 I made this little outfit before Pigg#3 was born and just haven’t blogged about it yet. It’s basically the same type of outfit that I made for Pigg#3’s blessing, but in a bigger size. 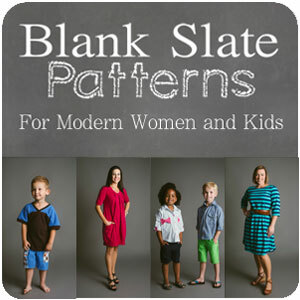 And I had a store made garment to trace around and use as a size guideline. I gave it away as a gift, but I’m pretty sure it will fit. The snaps worked better on this one. I’m a big fan of rompers for my baby boy because they are comfy and easy, but a bit more than just a onesie. 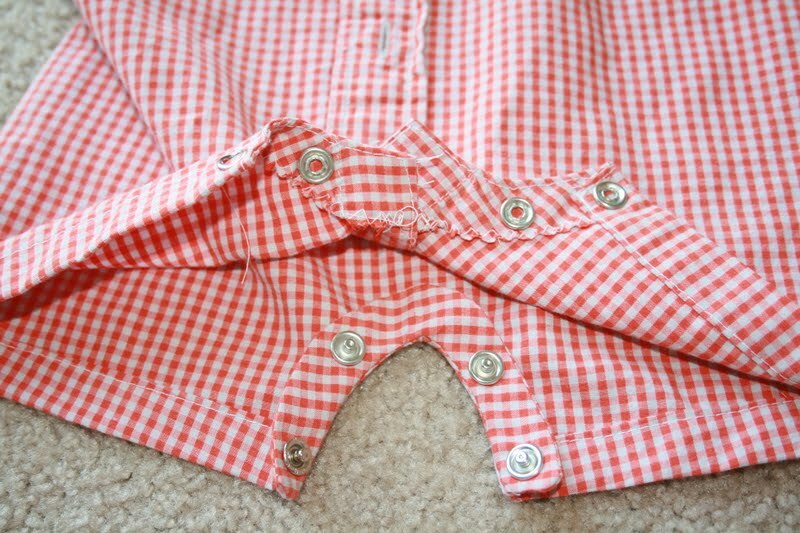 And I think these are a great way to use up dress shirts that just aren’t working for the big man in your life anymore. Very cute! It's nice your man gives you dress shirts before they're thread-bare. 🙂 Do you have to undo the buttons to get it over his head? 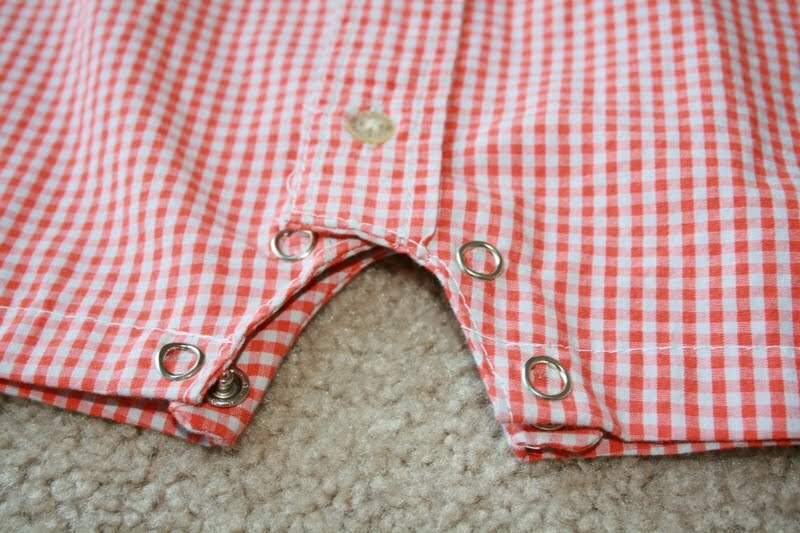 I've considered adding snap tape to a few of Jacob's button shirts (and then sewing the buttons on the top layer) to avoid having to do buttons on a wiggly boy (Daddy complains buttons don't belong on kids' clothes). I love it! I made one of those when I was pregnant with Guy and had to have Janae help me with the collar. This was on my to-do list all summer and I never did it…..darn…..because yours is adorable!!! !